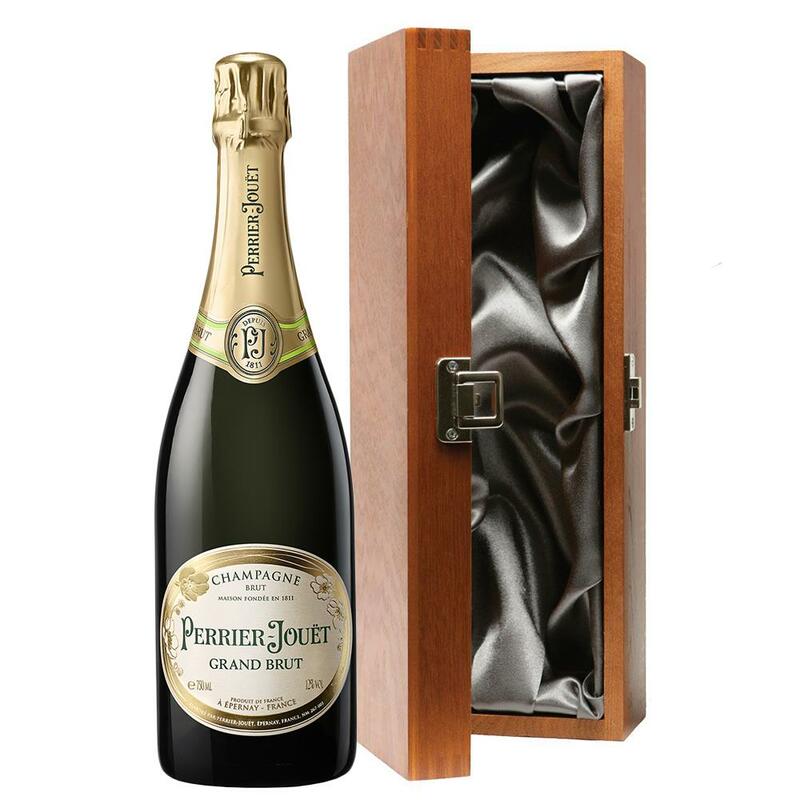 Perrier Jouet Brut 75cl presented in a beautifully crafted, dark stained elm wood case, complemented with stainless steel silver hinges and clasp. The case is elegantly lined in gunmetal grey satin, adding the wow factor to any bottle of champagne. Send a Luxury Gift Box of Perrier Jouet Brut 75cl for any occasion - Why not make it a gift set and add some more options under the price and we will pack them all together as one gift for you! The Grand Brut effortlessly mixes the staple three Champagne grapes (Chardonnay, Pinot Noir, and Pinot Meunier) together to create an intricate yet lively wine. Perrier-Jouët is one of the finest Champagne Houses in the world and known for the elegance of its wines. It is also the first to have created a dry Champagne, which led to the production of its famous Brut in 1856. With fruity and floral notes merging with one another to create a delicately smooth taste, unique flavours such as pineapple and grapefruit appear on the palate to separate this from the competition. It's these surprises that gives this balanced Grand Brut such a fantastic reputation.